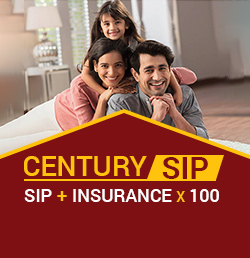 Aditya Birla Sun Life Century SIP is providing the extra benefit of life insurance to the investors without any extra cost. The Birla Century SIP Plan works on a sound investment philosophy which will help you in realising your goals, and also secures you and your family’s future with a life insurance cover. The cover of Aditya Birla Sun Life Century Plan (CSIP) amounts to Rs 26 Lakh for the investors who invest with MySIPonline keeping a minimum SIP of Rs 1,000. The tenure of ABSL Century SIP Plan will be at the maturity of the committed SIP Insure or before the completion of 55 years of age, whichever is earlier. Aditya Birla Sun Life Mutual Fund has brought for investors a number of glorious schemes to help them achieve their financial goals. It has been continuously putting in great efforts to encourage investors invest and earn the time value of their money. ABSL Century SIP is one such step that it has taken, encouraging people remain invested through SIP for a long tenure so as to achieve their long-term goals. Let’s read what this Birla Sun Life Insurance is all about. Century SIP by Aditya Birla Sun Life Mutual Fund is an opportunity to invest in a SIP plan with free life cover worth 100 times the monthly SIP investment (three year onwards). While SIP helps an individual to avail long-term investment benefits in the form of rupee-cost averaging and compounding benefit, the free cover ensures the financial security of the family in case of investor’s death. Why Invest in Birla Sun Life Insurance Plans? Any person who is a resident or NRI from eligible countries with age more than 18 years and less than 51 years is eligible to invest in these plans. There are a number of benefits as to why one should invest in Birla Sun Life SIP Insure. Below are points that showcases the same. Light on the Pocket - SIP plans have a systematic investment approach that help investors to start investment with a small amount without being a burden on his/her pocket. Simple Payment Modes - It is convenient to pay as there are different modes of payment involved such as NECS, Direct Debit, PDC Cheques or STP in Birla Sun Life Century SIP. Long-Term Growth - Investment in Birla Sun Life Insurance Plans lead to reasonable returns in the long-term as they hold the potential to capitalize the growth which equity schemes have to offer. Free Life Cover - The insurance under Aditya Birla Sun Life Insurance Plans are absolutely free as the cost of insurance is taken care of Aditya Birla Sun Life Asset Management Company itself. Minimum Investment Amount - An investor may start his investment in these plans with an amount as low as Rs. 1000. There is no maximum limit which means that the investor is free to invest as much as he wants in the form of SIP. Easy Process - Investment in Birla Insurance Plans is really simple and hassle-free as there is no medical test which is conducted. Maximum Cover - An investor’s family is eligible to receive an amount of Rs. 25,00,000 which is the maximum limit in case of his/her death. This is a great opportunity to get a life cover of such amount without paying any premium. Loads - There is no entry load which an investor has to pay. There will be exit load of 2% which will be applicable in case the investor redeems the units within one year from the date of investment. If the units are redeemed from one to three years, then 1% will be payable as exit load. No load is chargeable if the redemption is made after three years or in case the investor has died. Cover - It covers the accidental death of investors within 45 days of commencement of SIP. In case of death of investor, the nominee will be eligible to receive the insured amount in addition to the fund value. What will Lead to the Termination of Aditya Birla Insurance? If an investor redeems fully or partially before completion of CSIP tenure, then he will no longer be eligible for the insurance cover. In case any two continuous installments are not payed by the investor or four installments over the period of time in CSIP, it will lead to termination of insurance. Let’s understand how it works through an example. If an investor invests Rs. 25000 monthly, then in one year the insurance cover will be worth Rs. 2,50,000 (10*25000). In the second year, this cover will be Rs. 12,50,000 (50*25000) and in the third year, the cover would be Rs. 25,00,000 (100*25,000). In case the SIP is continued after three years, the insurance amount will be either the fund value at the beginning of each policy year or 100 times the monthly installment amount which ever is less. This was all about CSIP in mutual fund, to invest in the SIP plans by ABSL MF, simply log onto MySIPonline. For any help that you might need, feel free to consult the financial experts at our platform. ABSL Century SIP Plans are my favorite when it comes to investment in SIP plans. Not only the schemes by Aditya Birla Sun Life Mutual Fund good, the life insurance that has been attached to it has simply made it an outstanding choice. I am really happy and thankful to the experts at mysiponline for suggesting me the same. I have already recommended it to my friends, family and would say the same to anyone who wishes to invest via SIP.